COMAC signs Framework Strategic Cooperation Agreement with CAUC__Commercial Aircraft Corporation of China, Ltd.
Commercial Aircraft Corporation of China, Ltd. (COMAC) signed a Framework Strategic Cooperation Agreement with Civil Aviation University of China (CAUC) at the opening ceremony of the 12th Airshow China on November 6th, 2018, in order to further consolidate the previous cooperation achievements, enhance the strategic cooperation relationship and drive the development of commercial aircraft industry. 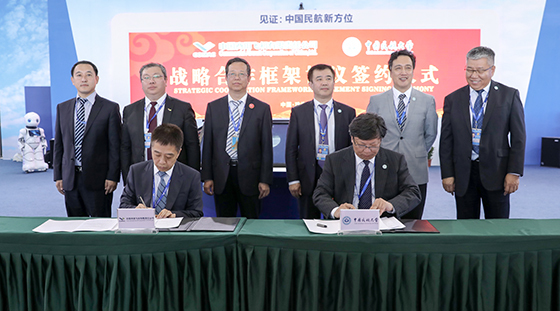 Mr. Liu Linzong, Deputy Secretary of the Party Committee and Vice President of COMAC, and Mr. Jing Yihong, Secretary of the Party Committee of CAUC and Mr. Dong Jiankang, President of CAUC, attended the signing ceremony. Mr. Liu Linzong expressed that signing this Framework Strategic Cooperation Agreement would further promote constructing the joint training and practice base for order-oriented talents, pilots, part-time postgraduate students, and promote the development and industrialization of commercial aircraft and the study and application of operational support technologies. He hoped that both sides could take this cooperation as an opportunity to further implement and study Xi Jinping Thought on Socialism with Chinese Characteristics for a New Era and the spirits of the 19th National Congress of the Communist Party of China (CPC), implement the spirits of the major instructions made by General Secretary Xi Jinping on trunk liner career, keep our mission firmly in mind and work together to build a strong civil aviation country, and make new and greater contributions to realizing the Chinese Dream and the Dream of trunk liner. Mr. Jing Yihong expressed that CAUC had insisted on studying and implementing Xi Jinping Thought on Socialism with Chinese Characteristics for a New Era and the spirits of the 19th CPC National Congress, implementing the overall deployment of the Civil Aviation Administration of China (CAAC), and providing strong support for the airworthiness certification, system construction and talent cultivation of the China-made commercial aircraft. He hoped that both sides could take this signing as a beginning to further expend the cooperation fields and firmly push forward the industry of China-made commercial aircraft. CAUC would fully exploit the centralized resource advantage of technology, talents and information and try to provide greater support for the development of COMAC. In accordance with this agreement, COMAC and CAUC would center on the vital target of developing trunk liner program; establish comprehensive cooperative relationship in science and technology research & development, achievement transformation, talent cultivation and international cooperation; effectively utilize the development and commercial operating conditions of the trunk liner and regional aircraft of COMAC; fully exploit CAUC's highly centralized resource advantage of technology, talents and information; enhance the independent innovation capacity and core competitiveness of COMAC;and establish a long-term mechanism for closely integrating the production, education and research of universities and industry. CAUC, directly subordinate to Civil Aviation Administration of China, is a comprehensive university focused on cultivating senior engineering and management personnel in civil aviation industry. Through 67 years of development and progress, this university has built itself into an institution of higher education with a complete range of subjects, cultivated over 100 thousand graduates for civil aviation and the society, and has been hailed as the cradle of civil aviation talents of china, the center of science and technology studies and the window of international cultural communication. COMAC signed a Framework Strategic Cooperation Agreement with CAUC in May 2011, aiming to carry out a series of comprehensive cooperation in talent cultivation, airworthiness certification, construction of customer service support system, scientific and technical research, etc.